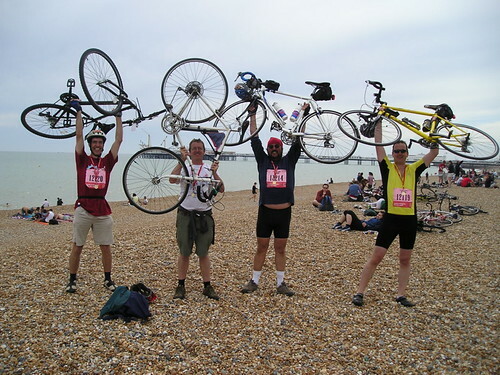 Michael Jecks: Photo Diary » Blog Archive » We MADE IT! We MADE IT!, originally uploaded by michael_jecks. From there it was a breeze for the last few miles into Brighton. A wonderful day, great fun and excellent support from all â€“ especially the couple at the top of Ditchling Beacon who kept everyone motivated by calling out encouragement from the bank at the last summit! So thanks to all those who sponsored me and the Dart-i-moor Pisskies riding team, otherwise known as Bazleâ€™s Bikers, I think, although he disagrees. Weâ€™ve raised somewhere over Â£1,500 between us, whichâ€™ll hopefully go nicely towards the British Heart Foundationâ€™s research budget. We had a great time, and hopefully weâ€™ll have done some good by going on the ride! « This is the top of Ditchling Beacon. This entry was posted on Tuesday, June 19th, 2007 at 3:15 pm	and is filed under Bike ride, Dartmoor. You can follow any responses to this entry through the RSS 2.0 feed. You can skip to the end and leave a response. Pinging is currently not allowed.